DEARBORN, Mich. (AP) - The California man accused of plotting to blow up a Detroit-area mosque rejected his court-appointed counsel Friday, upset that the attorney is a Shiite Muslim and a "patron" of the Islamic center where he was arrested. 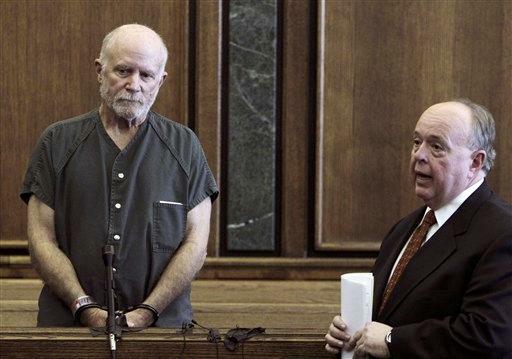 Roger Stockham, 63, standing in handcuffs and wearing an olive drab jail-issued jumpsuit in a Dearborn courtroom, rejected defense attorney Mark Haidar and was appointed a new attorney during a hearing to determine whether there is probable cause to try him. The hearing was then delayed until next Friday so that new attorney Matthew Evans could prepare. Stockham, who has described himself as a Vietnam War vet-turned-Islamic holy warrior, has a history of violent run-ins with the law dating back to the 1970s. He faces charges of making a false report or threat of terrorism and one count of possessing explosives with an unlawful intent after being arrested Jan. 24 near the Islamic Center of America in Dearborn. "I reject my appointed counsel. He is a Shiite," referring to a sect of Islam practiced at the Dearborn mosque, one of the nation's largest. "He is a patron of the mosque." There are two main sects within Islam, Shiite and Sunni. The schism between Sunni and Shiite stems from the early days of Islam and arguments over the Prophet Muhammad's successors as the faith's spiritual leader. Haidar didn't attend Friday's hearing because he was out of town. In a telephone interview, he said he had told Stockham about his faith and that he has attended services at the mosque. He said he was surprised by Stockham's decision. "The judge probably shouldn't be listening to someone with his mental history," Haidar said. "I would think he shouldn't be the one making the decision at this point." Haidar said he had planned to have another attorney request a competency evaluation for Stockham based on his history of mental illness. Evans, however, said he wouldn't do that because Stockham understands the charges and court process and can participate in his defense. Stockham "definitely has strong convictions, but I think he's sane," Evans said. Stockham appeared lucid during the morning hearing, telling the judge he was satisfied with his new attorney and understood that he was waiving his right to a preliminary hearing within 14 days. He asked the judge for "a commitment it would be within seven days," and the judge said the hearing would be held as scheduled. Somers also asked Stockham if he would need an attorney for his misdemeanor charge of possessing an open container of alcohol in his vehicle. "Only if it's necessary," Stockham replied. "I think I can handle it myself." Stockham also asked for a copy of the charges against him. Stockham's legal run-ins include one in which he kidnapped his son from a foster home and crashed a plane while trying to get away. He has twice been committed for psychiatric treatment by the courts, and a former attorney said he was diagnosed with bipolar, post-traumatic stress and personality disorders. Military records obtained by the AP on Friday show Stockham enlisted in the Army in 1965 and was sent to Vietnam in 1968 as an active duty reservist. His decorations include a National Defense Service Medal, Vietnam Service Medal, a Vietnam campaign medal and an Army Aviator Badge. He also earned marksmanship badges with a rifle and pistol. He was ultimately discharged in 1974 with the rank of captain. Stockham earned his high school general education diploma in 1966 and an associate's degree in general education from Santa Barbara City College in 1972, according to the military records. Police have not discussed why they believe Stockham may have targeted the Dearborn mosque, which predominantly serves the area's sizable Arab community. Evans insisted his client isn't anti-Muslim, since he converted to the religion after serving in Vietnam, but spoke of his outrage over U.S. conduct in Iraq. Witnesses told investigators Stockham sipped Scotch at a nearby sports bar hours before his arrest and bragged about how he was going to cause a big explosion. Police said when they pulled Stockham over, he was wearing a ski mask and had more than two dozen fireworks in his car, including M-80s, which are illegal in Michigan. Joe Nahhas, a manager at the Detroit bar Stockham visited before his arrest, said Stockham claimed to have become a Muslim after returning from the Vietnam War and said he recognized that Stockham could speak at least some Arabic. He also said Stockham claimed to be part of a group of Indonesian mujahedeen, or holy warriors. Nahhas said he called 911 to report Stockham. Evans said he has seen no evidence that his client threatened to blow up the mosque. Still, mosque officials remain concerned. Board chairman Afif Jawad, who attended the hearing, said he and other leaders continue to meet with local and federal law enforcement officials about the incident. "This man knows what he's doing," Jawad said. "This man picked on the Shiites. . . . That's a threat to the community."